I wrote this story for Al Jazeera on Dec.17, 2015, the day that the United States and Cuba announced that they were re-establishing diplomatic relations. (See original version). Havana, Cuba – Cubans hugged each other and cried. They marched and cheered. They gathered on street corners and in cafeterias to talk about the stunning news that Cuba and the United States were restoring diplomatic ties after decades of hostility. Nuñez, 66, thanked President Barack Obama for releasing three Cuban intelligence agents who had been jailed since 1998. The spies – Gerardo Hernandez, 49, Antonio Guerrero, 56, and Ramon Labañino, 51 – were returned to Cuba on Wednesday. Two others – Rene Gonzalez, 58, and Fernando Gonzalez, 51 – were released earlier before completing their sentences. Cuban officials had pushed relentlessly for the release of the “Cuban Five” as they were known. The government staged mass marches and protests reminiscent of a campaign demanding the return of Elian Gonzalez, a six-year-old Cuban boat wreck survivor who when in the US was thrust into the centre of an international custody dispute in 1999. Some Cubans grumbled about the long-running campaign to free the five spies, but news of their release and the prospect of normal relations with the US was all people were talking about Wednesday. “We were all sure the Cuban Five would return one day, but we didn’t know when,” said Juana Garcia, 65, who stood outside her home in Havana. “How many years has it been? Fifty-some years – way too long,” said neighbour Haydee Cuellar, 48, who runs a so-called casa particular, a home offering rooms to tourists. Iglesias said he welcomes increased tourism from the US, along with measures to allow Americans to use credit cards and ATM machines on the island. 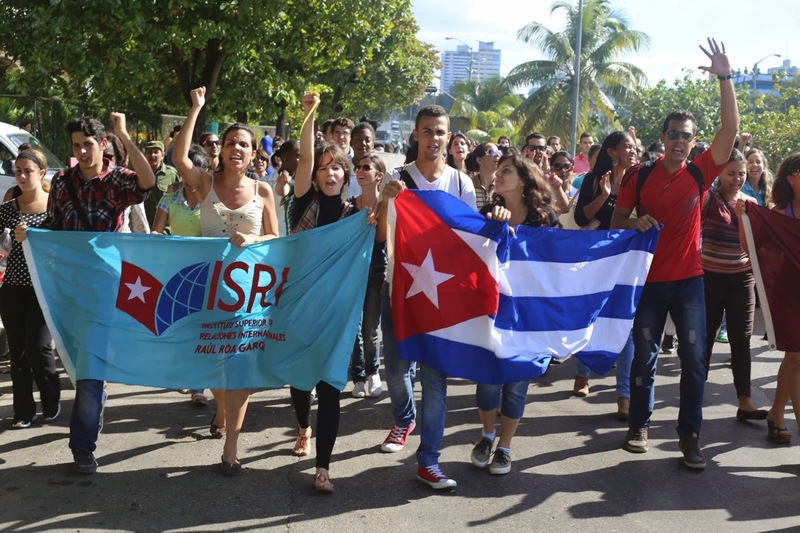 Students from the Raul Roa Garcia Institute of International Relations in Havana paraded through the streets in celebration after hearing that the US and Cuba were moving to restore diplomatic ties. 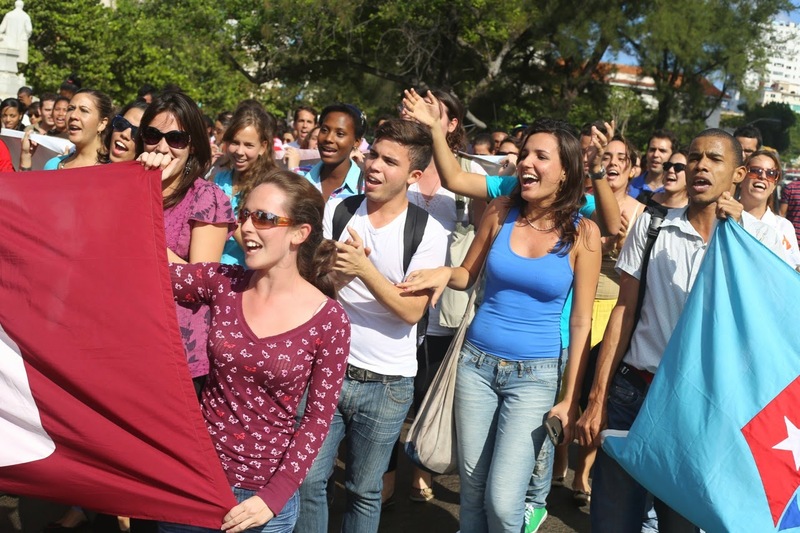 Residents cheered as the students romped through Havana’s Vedado neighbourhood. Some residents waved from open windows. Others peered down from apartment balconies. Students, numbering at least 100, blocked traffic and waved banners and the red, white and blue Cuban flag. Their final stop was the Institute of International Relations, where dozens of American academics, analysts and anti-embargo activists had been meeting with their Cuban counterparts to debate the prospects of improved US-Cuba relations during the final two years of the Obama administration. Participants at the conference cheered when President Raul Castro announced the three spies were heading to Cuba. “These are truly historic days,” said Sarah Stephens, director of the non-profit Center for Democracy in the Americas in Washington, DC. Stephens said she believes that lawmakers will eventually dismantle the Helms-Burton Act, which bans most trade with Cuba. Mike Kopetski, a former congressman from Oregon state, said he supports the move to restore relations with Cuba. Kopetski joined Cuban students who marched in the streets, celebrating Wednesday’s announcement. He said the US and Cuba should try to learn from each other. Deysi Mata Nuñez, the Cuban woman who sells dolls, said Obama’s announcement is a vindication of the Cuban revolution.